Samsung started releasing Android 7.0 Nougat for their Android Smartphone we already posted many Samsung phones Android 7.0 Firmware. 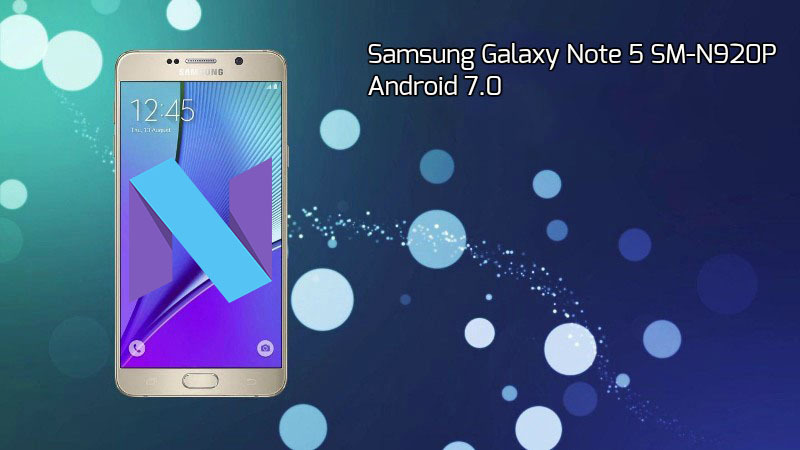 We already posted Android 7.0 for Galaxy Note 5 AT&T version. Samsung still not released Android 7.0 Nougat Firmware For many USA Samsung device but they released for Galaxy S6 Note 5, Note 6, Galaxy S7. And here the Galaxy Note 5 SM-N920P Android 7.0 Sprint Firmware. We created the direct download link for Sprint Galaxy Note 5 SM-N920P Sprint Firmware and guide you how to install it. Samsung released Android 7.0 Nougat for Galaxy Note 5 SM-N920P Sprint variant via OTA. If you are not received the OTA on your phone or out of the USA you can install the SM-N920P Android 7.0 Nougat via Firmware Install. This Android 7.0 Galaxy Note 5 SM-N920P can install via Samsung Odin tool or Samsung Kies we will guide you how to install via Odin. The user interface has been revamped throughout. Performance is much faster now. Entirely new quick settings panel. New features in the phone and contacts apps. Enjoy better battery life new battery management feature for better battery performance. Customizable presets for medium power and maximum power saving modes. The app power monitor detects inactive apps are consuming the battery. Nougat’s split-screen feature lets you use two apps side by side. New effects and filters in the camera app. You can view the filters by swiping the screen from right to left when the camera app is open. Browse the web more securely and login websites using your fingerprint using the new Samsung internet and Samsung pass apps. Login credentials for various sites as Samsung pass securely. Using the performance mode, you can now enjoy a better performance by choosing from optimized, game, entertainment, and high-performance modes to optimize. Battery consumption and improve device performance. The new keyboard is configured updates language data automatically and provide better predictions. You can now choose between QHD and full HD display resolution. Make sure your device is Sprint SM-N920P. Then click The Pit Option and select Pit file from the firmware folder. Select BL, AP, CP, CSC from firmware folder. Read Full Odin Flash Guide From Here->.